Jeep Wrangler JL shocks by ICON Vehicle Dynamics 2.5″ Suspension System is designed for the driver looking to drastically improve the performance and ride quality of their vehicle. Through an accelerated testing process dubbed the “ICON1K” R&D program, ICON has logged over a thousand miles in the dirt pushing the Jeep JL to off-road extremes to identify limiting factors in OE components, develop products that remove these limits, and further extrapolate performance out of this vehicle. 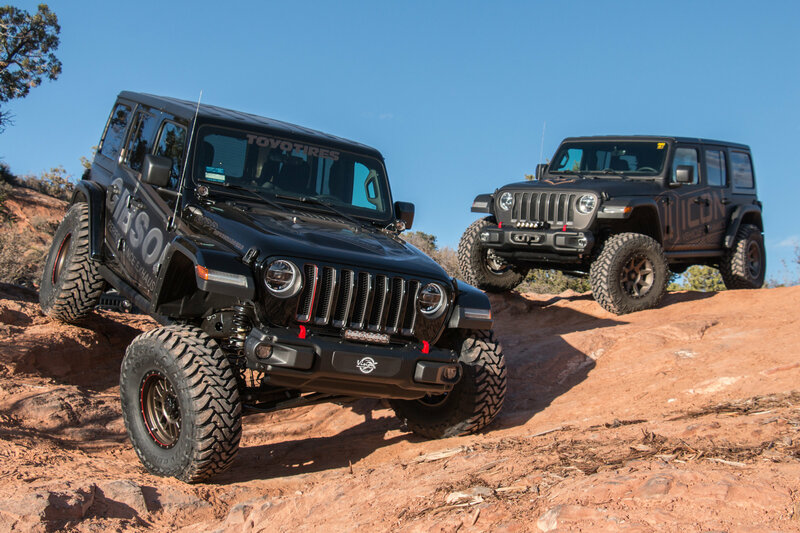 Jeep Wrangler JL shocks in the ICON suspension system have been tweaked, tuned, and revised several times over the course of this ICON1K testing in an effort to provide unparalleled ride quality and vehicle dynamics for everything from rock crawling to high-speed desert running. Jeep JL Offroad shocks in the ICON system includes 2.5″ lift dual rate coil springs, Vehicle Specific 2.0 Aluminum Series shocks, tubular steel front lower links, bump stop spacers, sway bar links, and all necessary hardware to complete the installation. With this combination of components, ICON was able to increase wheel travel numbers by over 30% (3″ front, 2″ rear), redefining the potential of the Jeep Wrangler JL. The front lower links included with the Jeep Wrangler JL Shocks and ICON suspension system are constructed from thick wall steel tubing, provide increased castor numbers, and feature dual durometer bushings for noise free operation, maximum articulation, and minimal bind. Each Stage system allows for fitment of 35″ tires when used with ICON’s recommended wheel specifications. For users looking to install 37″ tires, an optional bump stop spacer kit 22029 that is available. When developing suspension components for a new vehicle, ICON takes a different approach than many others. Rather than focusing in on one particular part, ICON engineers look at the vehicle as a whole, identify inherent strengths and weaknesses, and set a target for performance. With a focus on maximizing wheel travel and improving ride quality, ICON will develop components that address, and often times replace, OEM limiting factors. This “holistic engineering” philosophy often results in the development of several parts designed to work together as a system to provide a balanced on and off-road performance upgrade. ICON is designing and manufacturing all of the components necessary to improve the performance of a vehicle from front to back. Jeep Wrangler JL Shocks enthusiasts can rest easy knowing they are dealing with ONE manufacturer, ONE standard of quality, and ONE awesome warranty to back it all up.